Researchers are using a large sample of galaxy cluster to investigate dark energy. 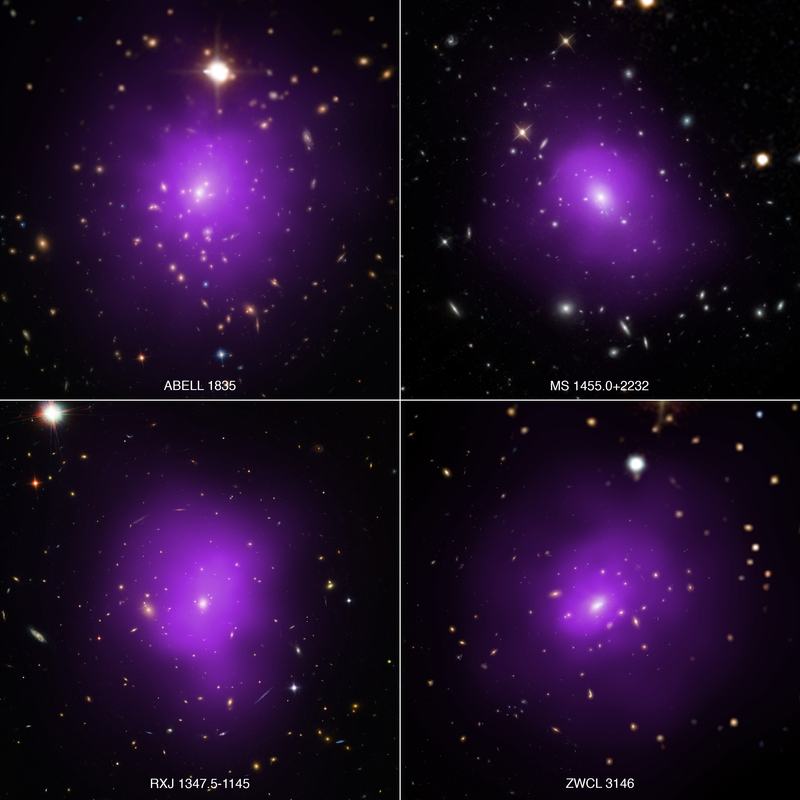 The details of X-ray emission from over 300 galaxy clusters were obtained with Chandra. The galaxy clusters range in distance from about 760 million to 8.7 billion light years from Earth. The study shows that dark energy has not changed over billions of years. These four galaxy clusters were part of a large survey of over 300 clusters used to investigate dark energy, the mysterious energy that is currently driving the accelerating expansion of the Universe, as described in our latest press release. 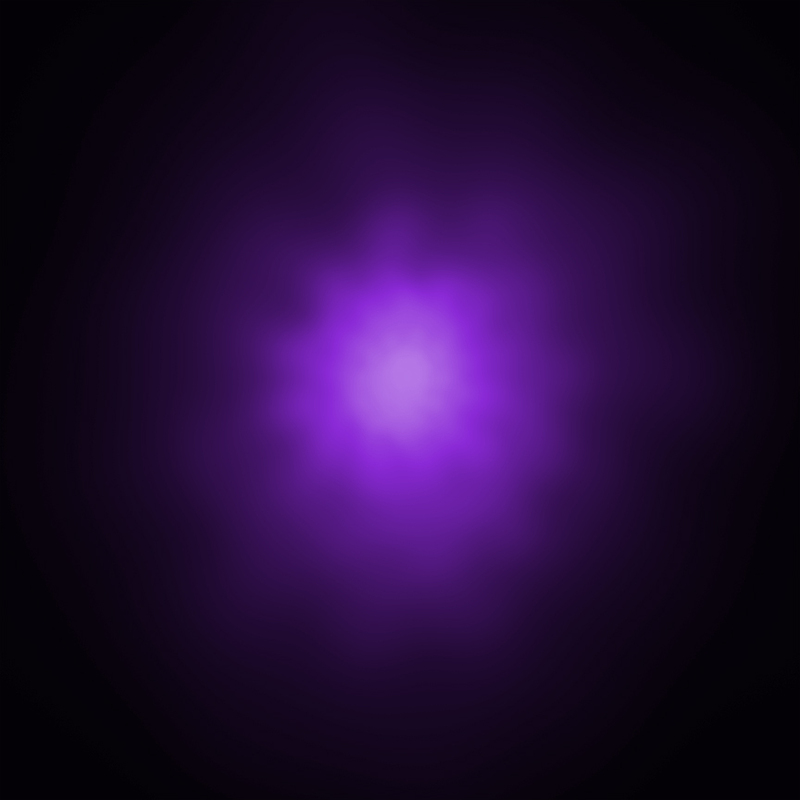 In these composite images, X-rays from NASA's Chandra X-ray Observatory (purple) have been combined with optical light from the Hubble Space Telescope and Sloan Digital Sky Survey (red, green, and blue). Researchers used a novel technique that takes advantage of the observation that the outer reaches of galaxy clusters, the largest structures in the universe held together by gravity, show similarity in their X-ray emission profiles and sizes. That is, more massive clusters are simply scaled up versions of less massive ones, similar to Russian dolls that nest inside one another. The amount of matter in the Universe, which is dominated by the unseen substance called dark matter, and the properties of dark energy (what astronomers call cosmological parameters) affect the rate of expansion of the Universe and, therefore, how the distances to objects change with time. If the cosmological parameters used are incorrect and a cluster is inferred to be traveling away faster than the correct value, then a cluster will appear to be larger and fainter due to this "Russian doll" property. If the cluster is inferred to be traveling away more slowly than the correct value, the cluster will be smaller and brighter than a cluster according to theory. These latest results confirm earlier studies that the amount of dark energy has not changed over billions of years. They also support the idea that dark energy is best explained by the "cosmological constant," which Einstein first proposed and is equivalent to the energy of empty space. The galaxy clusters in this large sample ranged in distance from about 760 million to 8.7 billion light years from Earth, providing astronomers with information about the era where dark energy caused the once-decelerating expansion of the Universe to accelerate. The X-ray emission in the outer parts of galaxy clusters is faint because the gas is diffuse there. To deal with this issue in this study, the X-ray signal from different clusters was added together. Regions near the centers of the clusters are excluded from the analysis because of large differences between the properties of different clusters caused by supermassive black hole outbursts, the cooling of gas and the formation of stars. A paper describing these results by Andrea Morandi and Ming Sun (University of Alabama at Huntsville) appeared in the April 11th, 2016 issue of the Monthly Notices of the Royal Astronomical Society journal and is available online. NASA's Marshall Space Flight Center in Huntsville, Alabama, manages the Chandra program for NASA's Science Mission Directorate in Washington. The Smithsonian Astrophysical Observatory in Cambridge, Massachusetts, controls Chandra's science and flight operations. Coordinates (J2000) RA 14h 01m 02.30s | Dec +02° 52´ 48.00"
Coordinates (J2000) RA 14h 57m 15.10s | Dec +22° 20´ 34.01"
Coordinates (J2000) RA 13h 47m 33.53s | Dec -11° 45´ 42.12"
Coordinates (J2000) RA 10h 23m 39.63s | Dec +04° 11´ 10.36"